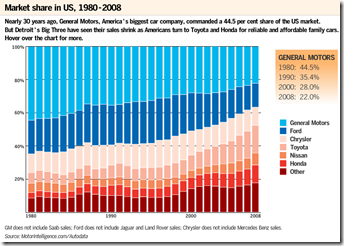 GM has been losing market share for more than 50 years. It has known about its reliability and quality problems for many years and has not been able to do anything about them. There were 16 high potential managers that were sent to NUMMI to learn the lessons and take them to the other GM plants around the country. What they found in the other plants was a corrosive culture so embedded and change resistant that most of them decided to leave GM, the challenge was just too great. Change resistant – the workers liked things they way they were, they were well paid and did not necessary have to work hard for their compensation, why change? Seniority – the managers like things the way they were, compensation was linked to a hierarchy and many workers had waited years to be moved into management. When they became managers they did not want to accept any change that may reduce their seniority. More people reporting to them meant more power, Toyota’s team based approach would undermine these hierarchical structures. Team Work meant telling on each other – there was a perception that team work meant calling out under performers and this was seen as unfair and negative. GM was very departmentalized (silos) – there was a lack of ownership and connection between individual department success and overall success. When plants tried to implement “Toyota” methods they were not supported by the broader GM organization. 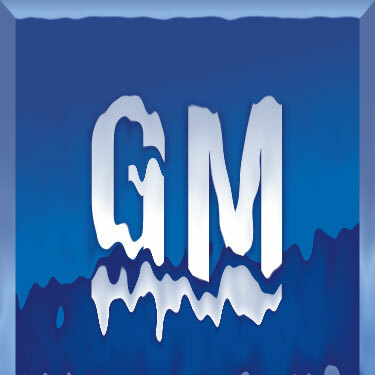 GM simply did not understand the deeper system Toyota had developed around the factory floor. Combative nature of relationships with suppliers. GM was used to aggressively competing with suppliers to get the best terms not working on collaborative solutions where both parties maximized their benefits from the relationship. GM’s Market share went from 45.5% to 22% over the past 30 years – it was a significant but slow decline that did not generate real urgency. Complacency had set in. GM’s decline is an incredible example of a corporate culture so internally focused that decline was an inevitable and it seems almost unstoppable. Was this inevitable? What could have been done to turn the situation around? The short answer is strong leadership that connected everyone’s role with customers and clearly articulated the individual benefits of being customer focused and market-driven. This entry was posted in Competitor Insight, Cross-functional Collaboration, Customer Insight, Market Culture Inaction, Ownership, Silos, Uncategorized and tagged linkedin; corporate culture; competitor insight. Bookmark the permalink.